Graphical representation of considered elements in the design of an online portfolio for language assessment. Three years ago, I had never heard the term Learning Design. Three years ago, I was just planning an online tool to make life a bit easier for online language programs and learners in Manitoba. This blog post is a quick background on our technology development context and the forces at play when developing an online tool we call – the Electronic Collaborative Language Portfolio Assessment (eCLPA). In those days, 3 years ago, there were a number of interacting elements impacting how language was delivered in our part of the world: policy changes, research support for language portfolios, growing immigration levels, changes in learner educational background, increasing body of knowledge of eLearning, funding interest in workplace readiness and digital solutions, unexpected registration for online self-directed language support, and a need for online platform to deliver learning. There is a plurality of drivers in this system and having just learnt about Force Maps in oldsmooc in January 2013, I thought this graphical tool captured the interplay of the push & pull tensions amongst all of the element variables. Three years ago, online self-directed learning was seen as an alternative resource for learners who could not attend more traditional face-to-face classes. The potential of online learning was embraced but the understanding of how that would be realized was yet to be determined; and, I would argue is still struggling to be understood outside of traditional models of learning. As the only self-directed model in the province (country? ), we were (and still are) facing a number of issues to demonstrate our relevance. 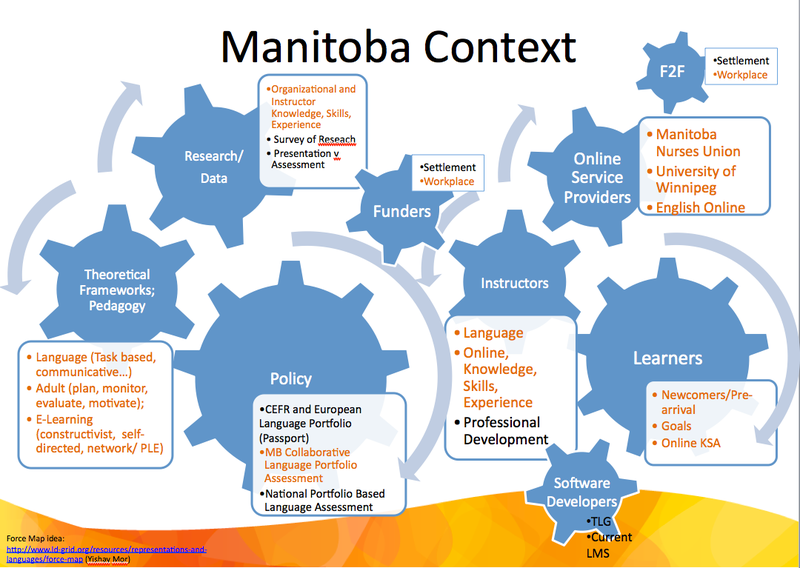 An opportunity arose when Manitoban language providers were required by the primary funder to use a Collaborative Language Portfolio for language assessment (CLPA) with learners. Our organizational question was: How do we incorporate the CLPA with online learners? However, as represented in the force map, our organization was not the only voice that needed to be included. We also had to consider the needs of affiliate organizations who were using the same Learning Management System (LMS) for online delivery of English for Specific Purposes (ESP) projects run by a Labour Union and a University. A case was made to receive funding for developing an online interpretation for the CLPA; we were given a year to launch an electronic CLPA. A number of decisions were made early in the process to ensure we could meet the deadline and work within budget. (I have never worked outside of these factors and I wonder if they are positive forces for focused energy or negative undercurrents that necessitates less investigation in certain areas:). I was (am) interested in open source solutions for our technology, and investigated some open source portfolio tools, but quickly understood that we would be creating a tool that would necessitate another login and space for learners to navigate. I wanted to reduce the orientation and teaching this would necessitate both for learners and also for instructors to learn a new technology. The Software Architect who customized our LMS was excited to help us create some new functionalities in our LMS. The positive relationship here is that our learning context and delivery needs were already understood by the programming team; however, the limitation we faced was that we needed to work the current technology and ‘business rules’ of the system. Instructors provided input during the design process as functionalities started to narrow. They were heavily involved in a tedious process of testing, inputing, clicking, printing, and sorting. Pages and pages of feedback were collected for every section of the developing tool. As changes were made, feedback forms were sent out again for every section. Timelines for turn around were very tight. I would love to learn how others conduct this part of the development process. Including teachers in the development, I thought, ensured buy-in, it also reduced training time on the technology because they had already invested time testing the different areas that were developed. The live launch of the eCLPA was only four days late, April 4, 2011. We are coming up to our two year anniversary of using the tool with learners and we have yet to conduct an extensive evaluation of the tool. Is the eCLPA helping with language learning? How is it helping? Which of the functionalities are working for what types of learners? We have organizational evidence that the tool is used and helpful to learners but I want to understand how online programs are using the tool. I want to investigate who and why some learners are add reflections, or using the self-assessment checklists. I know that programs had implementation issues because online programs were not prepared to introduce the tool and functions to learners; integrating different ‘best practices’ from other providers did not necessarily match with the delivery model of other organizations. It is imperative to evaluate the effectiveness of this tool in order to plan for future iterations, as well as understand how face-to-face providers might use it with their learners. It is #oldsmooc_w7, Evaluation. I have been looking forward to this week to help inform an evaluation of the eCLPA. This Saturday past I had a webinar to introduce the eCLPA to teachers across the country (we had 15 participants). One person at a time. If you have made it this far, you might be interested in taking a peek at the eCLPA, I have incorporated some of the reporting features and learner comments throughout the hour; to get to my presentation fast forward one hour. The first hour with Joanne Pettis, will give you insight into the paper based Portfolio Based Language Assessment that will be rolling out across Canada this year. Could the eCLPA be the digital solution?